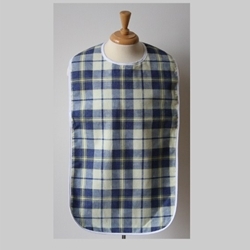 This blue yellow checkered adult bib has a full waterproof back barrier and is 18"W x 35"L. It also features an easy to use hook and loop neck closure. TEMPORARILY OUT OF STOCK. Available again in May 2019. Call to preorder.